Sean Spicer told reporters off-camera Monday that President Trump thinks Russia interfered in the 2016 election, but also thinks "other countries as well could have been equally involved." 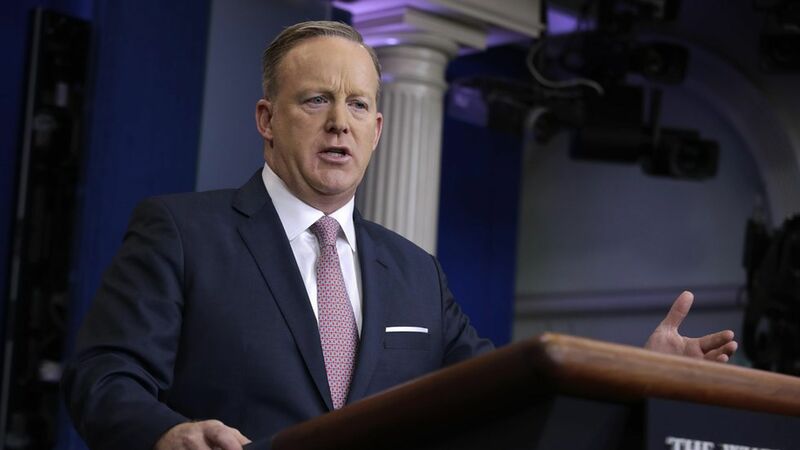 As for Barack Obama's response, Spicer said, "It's pretty clear they knew all along there was no collusion and that's pretty helpful to the president." He later asked, "they've been playing this card on Trump and Russia... If they didn't take any action, does that make them complicit?" On SCOTUS reinstating parts of travel ban: Trump "was honored by the 9-0 decision that allows him to use an important tool to protect the homeland." Adds that there is no guidance yet on next steps for implementation, but government is "reviewing the decision and determining how to proceed moving forward." Trump on health bill: "He wants a bill that has heart. He wants a bill that does what it's supposed to do... he wants to make sure people have access and it is affordable." Trump also called several senators this weekend, including Cruz, Paul, Capito, and Johnson. On Trump's calls for Russia to find Clinton's missing emails last summer: Trump "was joking at the time. We all know that." Why is today's briefing off-camera? "The president's going to speak today in the Rose Garden, I want his voice to carry the day."